Whether you're thinking of putting your home on the market or just want to refresh the look and feel of your home for spring, check out these 5 simple spring home improvement projects to increase your home’s value by boosting curb appeal and reducing energy costs! New Front Door: Let your front door be the beacon welcoming prospective homebuyers. Walking up to a bright and inviting front entrance will make a solid first impression. Update your molding, free the entryway from clutter, and use minimal decoration to complement your new front door. Garage Door Upgrade: A topnotch garage is a necessity for many homebuyers. Don’t miss the opportunity to make your garage a standout feature. Taking care of your garage inside and out will boost curb appeal and show homebuyers you care about every aspect of your home. Window Upgrade: Energy-efficient features are #1 on homebuyers most wanted list. According to a study by The National Association of Home Builders (NABH), 89% of homebuyers want Energy-Star rated windows. 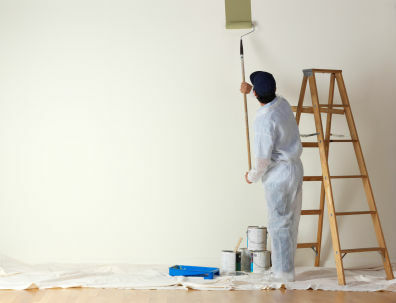 The Power Of Paint: Probably the easiest home improvement project with instant results. You can change the whole feel of a room with a new color. Opt for a varied neutral palette for wide appeal and plenty of personality. Lighting Love: Let in the light! Strategic lighting, energy-saving dimmers, programmable lighting, and replacing old bulbs with LED fixtures will enhance any room while reducing energy bills.